After Reading “Jack Wendell’s Vampire Syndrome,” I Felt As Though I Had Never Read a Vampire Novel Before. Really, how many variations of the vampire theme can there possibly be? Surely, this genre is well-worn; what can possibly be done to rejuvenate it? Welcome, “Jack Wendell’s Vampire Syndrome.” I promise, you have never read a vampire book like this one. Let’s begin this way: Jack Wendell, a Special Olympics champion with Down Syndrome, is turned into a vampire (hence the Vampire Syndrome in the title). That enough? Then how’s this: Jack strives for acceptance within his new community and is immediately ordered to be killed. 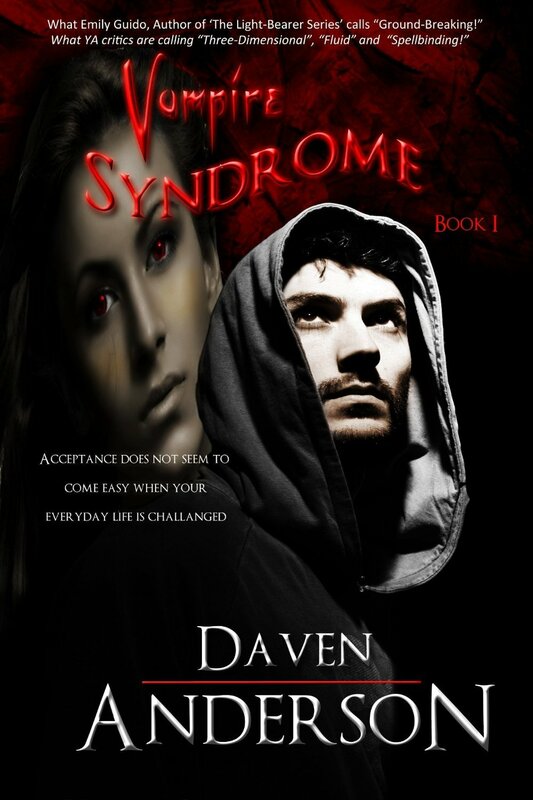 Read Daven’s synopsis on this site. It’s all there. He’s not joking about “space alien Pure vampires” either. Somehow, Daven Anderson makes it all work. The story is metaphoric for sure, but man is this work compelling. There’s a good deal of tongue in cheek here but not once did I feel the author or his story pandered. This is a compelling work. Jack Wendell is a character unique to modern fiction. Characters with Down Syndrome have been used frequently in media, see the television shows “Life Goes On” or “American Horror Story.” Autistic protagonists too have been used widely in literature over the past 25 years, but in lit circles fully drawn characters with Down Syndrome have been rare. Here though is something different and I hope I express this as I mean to: Jack is ‘cool.’ Do I feel sorry for him as he runs from his death sentence? Of course. Am I curious about his budding friendship with Lilith, who will attempt to save him? Yes. But more than this, I lose track of any disabilities on the part of the main character, and root for him as I would for anyone. And then it comes back to me that I’m reading a tale about a boy – a vampire – with Down Syndrome and I’m compelled to credit the author all the more. This is a special novel and certain to be a special series. Daven is clearly a unique author. He is also a special educator and knows this world well. Jack is a real person to me, in an extraordinary circumstance. The conflicts inherent therein make for the best of fiction. This is one of my very favorite novels that I’ve read all year. Kudos Mr. Anderson. A remarkable, fun work. For anyone concerned that using a character with Down Syndrome may be exploitative, do not worry. Jack proves he is capable of filling a valuable place in the vampire community, and he draws frequent parallels to the way regular society short-changes their expectations of people with DS. There may also be concerns that characters pan a vampire book/movie series based with no veil whatsoever on Stephanie Meyer’s Twilight series. …one of the strongest vampire characters loves the series and does not care what anyone says about it, so both sides are covered. I do want to address this quote below, as this is not the first time someone has made this criticism. (Jack) uses logic and problem solving skills I found unrealistically advanced for someone with DS. Jack is a composite of several people that I have worked with over the past twenty years. Two of them have read my book, and they both felt I was spot-on regarding Jack. Jack’s logic and problem-solving skills are in line with those whom I have worked with, who deal with customers in a retail environment on a continual basis. I will admit that it does require a certain level of aptitude regarding logic and problem-solving skills to work in a job requiring constant interaction with the public, but this applies to people at all levels of cognition, and there are many, many people of “normal” cognition who are not at all suited to working in retail. The movie “Where Hope Grows” features a main character with Down Syndrome who works in a grocery store (and its lead actor would be a great candidate to play Jack!). Thank you for your thorough and insightful review, Ariesgrl! By: Daven Anderson. Format: eBook. Read: January 2013. Breaking Dawn Part 2: Better than the novel?! Ah, what blasphemies I bring forth unto you! How can such be? The mere thought of a moving picture surpassing the printed word! The canes of discipline beg to strike my posterior in a most aggressive repetition. Alas, dear readers, it has happened before. Who among us would dare to differ that even Peter Benchley’s sterling work in Jaws lacked a certain instinctual impact that one could only achieve from the witness of a mechanical shark named Bruce? ‘Twas so nice to savor quiet reposes in the deserted waters of the Los Angeles beaches circa 1975 a.d., the would-be throngs of bathers held at bay by the recall of the emerging fin and its ominous tone of accompaniment. The paid broadcasts before the feature presentation bought forth a most odd twist of what their purchasers suppose to be “demographics”. Who among the adolescent assemblance would know of these painted minstrels of generations past, or for that matter the mechanized magnetic reels used to relay their fortissimo fortitude to the common folk? After such miscues, it was of most welcome relief to sight the fine lass Mrs. Bella Cullen finally released from her weakened state of servitude to the human condition. Verisimilitude via vampirism, the most dramatic allegory of maturation to the adult state. And for we, dear readers, the moving picture form releases us from seeing the tale through Bella’s limitations. Differences thereof most readily apparent even years before, guided to ultimate form in the saga’s ultimate film. The screen affixed us in the clairvoyance of Alice, allowing us to visualize the visceral version of a future path not taken. A future surpassing the peaceful forever of the Cullen clan, many would propose. A future satiating the audience’s primordial lust for combat, the ghostly apparitions of gladiators embedded in our collective consciousness, springing forth once more to entertain generations anew. But let us not forget that it is the printed word that lays the foundation for the visions that we seek. I’m standing near the entrance of a cave. The stars and a crescent moon are the only lights in the sky, yet I can see all the colors of the surrounding landscape as clearly as if it was daytime. Deep green grass and bright green leaves in the bushes at night. How can this be? A man in a long black coat points toward the cave. His deep voice startles me. Time for what? I look at my watch. Three-thirteen a.m. I take a step, then hesitate. Somehow, I know I have to go in there. But I don’t want to. Not just because caves are so spooky. I know something’s in there, waiting for me. The man clears his throat and points again. I walk slowly to the entrance. Looks okay so far. Time to go inside. It’s dark in here, but I can see everything clearly. The rock walls are filled with little sparkles of gold. Is this an old gold mine? Or maybe it’s all fools’ gold, like in the prospector shop near Buena Vista that Coach Ron and Diane took me to when I was eight. A crashing noise, coming from farther down in the cave, startles me. Could have been a rock falling. If I keep telling myself that, I might even believe it. The tunnel becomes steeper as I go down. A very cold breeze is blowing hard on my back. How come I’m not shivering? I don’t even have a jacket on, just a t-shirt and jeans. My brain knows how cold it is, but my body isn’t bothered by it at all. I pass through the end of the narrow tunnel. Check it out, I’ve just entered a huge underground cavern. The ceiling is full of pointy rocks. Some of them are dripping water. This looks like Carlsbad Caverns, but without all the bright lights. How come I can see all the colors? Lots of brown, green, red, orange and tan. This place is a rainbow of rocks. The white crystal coating on top of the big brown boulders in the right corner makes them look like a giant bowl of frosted cinnamon rolls. Wish I had my camera. To my left, one of the icicle-shaped rocks breaks from the ceiling and lands in a puddle of water. Was that the same rock-falling sound I heard before? I hope it was. Maybe an icicle rock falling on the floor of this cavern sounds different in the tunnel than it does here. At least I hope so. I feel an urge to enter the dark tunnel directly in front of me. As if someone inside is calling out to me. But I didn’t hear a sound. I heard it that time. No, I didn’t hear it. It’s coming from inside my mind. Am I hearing voices? A woman’s voice. Doesn’t sound familiar, but for some reason, I recognize it. Gold and silver sparkles on the walls light my way along the tunnel. I increase my pace from walking to running with no extra effort. Feels like I’m moving on a fast conveyor belt. At the end of the tunnel, a small cave. A beautiful woman stands before me. Her long, curly black hair covers the shoulders of her gold-trimmed black dress. I know her, she knows me. Her head is bowed down. Tears trickle down her face. Why is she so sad? It was the ghost woman I heard back in the cavern. Same voice, but now she’s speaking directly to me. I dash in front of the sad woman. She leaps into my arms and I carry her. How can I be lifting her so effortlessly? I’ve had a harder time lifting a bag of kitty litter. More ghosts approach us. The sad woman screams in terror. I have to get her out of here. I run. Fast. Too fast. Even carrying the sad woman in my arms, I’m zipping through the tunnels and caverns like I was downhill skiing. Except I’m running uphill. How can this be? The echoes of the ghosts calling out my name fade in the distance as I dash up the last tunnel. Once we escape the cave, a crowd of people watch as I stop running. I release her from my arms and she stands up. We wave to the crowd. She leans down to hug me, her long black hair brushing against me as she kisses my cheek. The crowd applauds and hollers. I study the people. Where’s the man in the long black coat? Several men hoist me into the air as the crowd chants my name. Awesome, I’ve become their hero. The woman I rescued begins swaying her hips like a belly dancer. Two women join her in the dance. I look toward the cave entrance. The man in the long black coat went in there. Somehow, I know he did. I’ve gotta get him out of there. The ghosts will get him. A nudge on my shoulder. How can that be? I’m way on top of the crowd carrying me. “Jack?” I know her voice. Someone just touched my hair. Thank you so much for featuring me, Emily!